Google SSL with URL which starts with https:// is a secure end-to-end search channel provided by Google over SSL (Secure Socket Layer). The service is for people who concerns about the search terms or keywords been intercepted, sniffed or eavesdropped by malicious hackers through plain text transmitted through typical web traffic. Google SSL can be accessed from https://www.google.com/ (which is temporarily redirects to https://encrypted.google.com/), where users will see a slightly modified Google logo with a lock and SSL wording. For Google Chrome web browser users who search directly from the address bar (which doubles up as search box), use the following hack to change and make Google SSL secure search as default search engine in Chrome. Click on the Wrench (Tools) icon and then go to Options. Under the “Search” section, click on the Manage button. Tip: The name and keyword is customizable, and can be changed according to your own preference. Note: Google has temporarily redirected all secure search through SSL to http://encrypted.google.com. If the above URL is not working or causing infinite loop, just change the “www” to “encrypted”. On the “Search Engine” list, select and highlight Google (SSL), and then click on Make Default button so that the new search engine is used every time Chrome is started. Tip: If you don’t want to set the Google SSL Search as default search engine, just type its keyword (i.e. 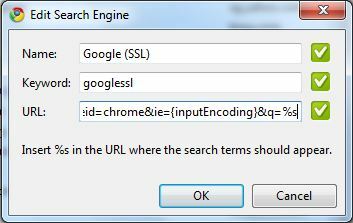 googlessl and hit space to search with the Google (SSL) search engine. Click Close twice to exit from Chrome Options. When searching with Google SSL Secure Search, the search terms will be encrypted, and search results will be presented on a SSL-enabled web page.